Equally interesting is the way the radical non-parliamentary left react to the Copenhagen experience. On the Modkraft.dk web site the centre stage in assessing the direct action is taken by Rene Karpantschof. He stated that COP15 activities was not a new Seattle, rather a Waterloo for the activist strategies that met with an effective and well-prepared police. December 12 at the Bella Center. Photo tcktcktck campaign. So, only partial success for the peaceful strategy. ”Instead, one could, as the world famous Naomi Klein, rely on the more radical activities. She did so in view of the alliances which the non-violent disobedience movement organized in the Climate Justice Action, CJA, had built up. So a full impact event like the protests in 1999, then giving birth to a new global movement. There must be more than very much to shake the powers like the U.S. and China. On the other hand: Repeated huge demonstrations and uncontrollable tumult scenes all over the world is a thought about something that could make an impression. At least on the governments of Europe. At least 10,000 rebel demonstrators would have been needed in Copenhagen for this. A number actually not inconceivable, given the international influx and that too many Danish, especially young people, see the climate as one of the greatest threats. In addition, many have low confidence in state leaders’ capacity, so the radical activists had good cards on their hand. Thursday and Friday the 17th and 18 December it was clear that the UN meeting resulted in nothing. In the same day the city was filled with state leaders who among other things should eat dinner at Christiansborg. It was here that thousands of outraged people could have flowed into the center of Copenhagen to spontaneous noisy demonstrations and other protests. If so, the new movement, Naomi Klein imagined had materialized. For the radical activists had during the summit’s first weeks experienced failure on failure. One did not get inside at some places, one had not blocked anything and one did not disrupt or upset anyone. The police consistently struck so they were in full control. And the result was a pervasive demoralization, discouragement and frustration, which held all the potential supporters from taking to the streets and join. There are many explanations. The activists had e.g. not taken any tactical consequence of the Danish police already before the climate summit had learned to handle the very controllable and predictable disobedience actions. When Danish activists in the autumn tried to close a coal-fired power station at Amager they made an unsuccessful assault against a well-armed police force. Nonetheless, attempts were exactly the same against a historic police posse in December. Openly advertised and non-violent disobedience actions have a certain legitimacy, but in practice only a chance if they mobilize many more participants than the cops. In the context of climate summit little was done to mobilize Danish sympathizers. Copenhagen was not plastered with posters with the precise time and place for the various actions. If one looked at the Internet among the usually English-language action calls, there was sometimes confusion about which actions actually started. And the most ambitious action at the Bella Center, 16 December started by Tårnby Station at. 8 in the morning. A relatively difficult accessible place and a time which in itself deters many from emerging. The activists also made it difficult for themselves with the unrealistic tactical objectives. From day one actions were presented that wanted to penetrate and block one place after another, and nothing of this was achieved, thus creating an atmosphere of failure. 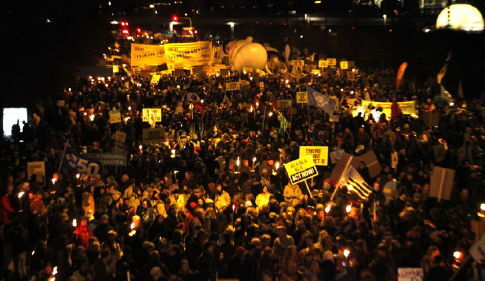 In addition, many Danes seem unsure and scared of the hooligan package and police force, and then Danish activists largely disappeared from the first action, the stage was left to a few hundred foreigners outside chance against the police. The police however had significant success in demonstrating their willingness to strike and their ability to control the streets. For example, 12 December where the militants had announced that they would gather at Højbro Plads and actions in the inner city instead of going into massive demonstration of that day. One can wonder that the superior police forces not only surrounded the few equally militant. Instead, police drove them into the big demonstration and then, since a few of them predictably broke windows and attacked police, carried out up to 1,000 preventive arrests. I do not know why the police acted so, but the result was certainly underlined strongly that everyone on the streets in those days risked imprisonment. Combined with the failure of the actions it had a deterrent effect. The courage of the militants disappeared completely when the police two days later stormed Christiania stressing that the police were capable of anything. The Danish police have been clever to be flexible and use ushers in an efficient manner, which targeted to address the crucial situations. Yes, it is sometimes violent and ruthless. But such is the game and it showed no signs activists to learn from. CJA project, 16 December was a predictable onslaught just where police stood ready, and with it far too small attendance of approx. 2000 participants were probably defeat. And with a form of action, which includes participants in the street in nine cold hours, there were no more strength left. Karpantschof is interesting in the way he puts emphasis on the physical part of politics. Why mobilise far out in a suburb against the official venue with the aim to unite delegates from the inside from both governments and movements with activists from the outside organizing a long People´s Assembly when one can mobilise easier at a gala dinner in the city centre with only top level politicians and make some noise for a short while? His approval of the demonstration as a success is also mainly in terms of numbers. Not even the failure of the demonstration committee to defend its participants is regarded as interesting to note. Instead the mass arrests in the December 12 demonstration more is used as an example of unclever activists. Karpantschof belongs to the generation of house occupants and radical autonom activists were many became the core of the anti capitalist global justice movement generation. Some of them now have key positions in the Red Green Alliance, others are still belonging to the non-parliamentary left as academicians or activists. Why this global justice movement generation failed to intervene constructively in the preparations for the climate summit like they successfully did in 2002 is interesting to note. On the contrary many of them acted ignoring the need for international solidarity. Why risk something when it is more safe to stand aside and look on what happens from a distance and afterward make it clear how clever the more realistic part of the non-parliamentary Danish left were than those that engaged in CJA. One key factor in understanding this part of the left is its extreme adjustment to single issue orientation, if possible linked with general anti capitalistic slogans. Quite a few of the global justice movement generation unwilling to help the COP15 mobilization were at the same time fully involved in the mobilization for Church asylum for refugees. This issue could very well fit into the political mobilization during the climate summit. The social liberal party made a statement one of the first days of COP15 focusing on the issue of climate refugees. But the left wingers in the Church asylum movement were unwilling to. This movement is to a large extent unpolitical, as many initiatives in Denmark it is no longer political change which is at the core of specific actions, but to ask for Denmark to once more become decent. To link the question of refugees from Iraq and thus from an oil war were Denmark was an aggressor was not something the left wingers in the Church asylum movement wanted to happen. Nor any formal Danish environmental, peasant or other organization. In Denmark different policy areas must be kept separate unless uncontrollable disorder will emerge in politics. Thus both the five left wing party organizations as well as portions of the non-parliamentary left all assess the mass demonstration as at least a partial success while the rest of the actions are paternalistically approved as they surprisingly were non-violent but all in all rather unimportant. All avoid addressing the historic failure of the left in collectively addressing the repression of a scale and a character that is of importance to the future of freedom of expression and popular movements in all parts of the world. The left have set an example under conditions that were not extreme in terms of weapons used by the police or violence but in terms of targeted arrests of spokes persons and mass arrests of anyone on the streets. This example of left wing neglecting the integrity of the demonstration and even companionship with the state needs an explanation.